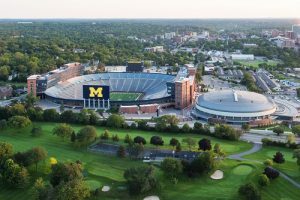 Event Description: An appealing site for a corporate team building event, the University of Michigan remains one of the most distinguished universities in the world and a leader in higher education, consistently ranked in the top three among the nation’s best public institutions. Location History: Founded in 1817 as one of the first public universities in the nation, the University of Michigan was originally located in Detroit before moving to tiny Ann Arbor (population 2000) twenty years later. The university’s early days were modest: 4 faculty homes, two professors, one dormitory, seven students and cows grazing over much of the campus. During your corporate team building treasure hunt… expect to see a statute of Hippocrates; a memorial to sprinter Jesse Owens; a mosaic of proud birds, and plenty more.